Tag Archive | "Pseudotropheus acei “ngara”"
The White Tail Acei (Pseudotropheus acei “ngara”) is a shoaling Mbuna cichlid found in the Ngara and Karonga areas of Africa’s Lake Malawi, that is closely related to the Orange Top Moori (Gephyrochromis moorii). 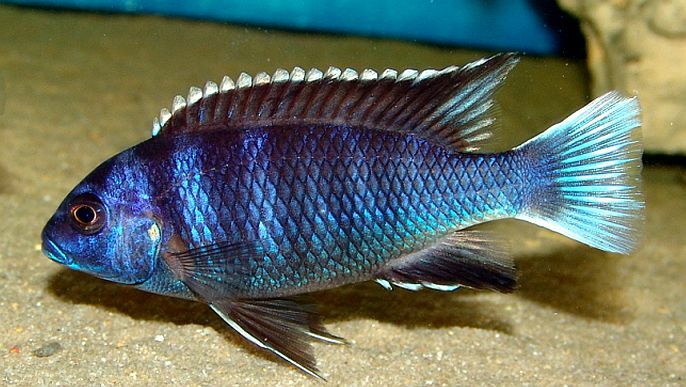 All Acei have vivid, bright colors that are generally blue to deep purples and violets that become darker and more electric blue around the face of the fish. The fins of all species range from cream to sunshine yellow, which makes them an outstanding looking fish in any aquarium. In the wild, several varieties of Pseudotropheus sp. “Acei” exist throughout the Lake Malawi but the most common form sold in tropical fish keeping shops is the variety from the Nkhata Bay and Bandawe area. These cichlids are colored a sparkly dark blue and have yellow fins. Another acei variety from the Ngara and Karonga area are sold as “White Tail Acei”. These fish are colored a paler blue and have white fins. The last acei variety comes from the South Rukuru River, Ruarwe and Senga Bay and are usually very pale in color. 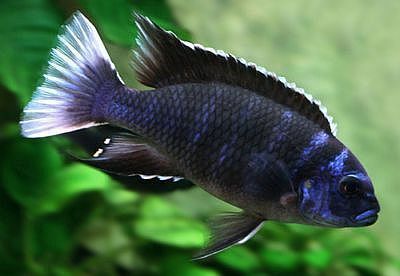 Pseudotropheus acei “ngara” has flat teeth and are pale blue in color with white fins and spots, “dummy eggs”, located on their ventral fins. The spots on the males tend to be brighter than those on the females. Males and females are colored alike but the males grow larger (up to 6″ in length) than the females. White Tail Acei prefer living among sandy, rock filled shorelines that are easily accessible to sunken logs, tree roots and bogwood. They have flat, cuspid like teeth that allow them to feed on crustaceans and harvest epixylic or epilithic algae from submerged bogwood, logs, tree roots, and rocks. In their natural rocky bottomed habitat, they prefer living in smaller groups of 3 to 10 individuals however, schools of 30 to 50 or more fish are commonly found surrounding large logs or sunken bogwood . hygrophila, vallisneria and anubias and a piece of sunken bogwood to mimic their natural environment. It is important to maintain a pH above 8.0 and a water hardness of 10-12 DH when introducing bogwood into the tank and a water temperature between 78°to 82°F. Acei are very active and good natured by mbuna standards. They occasionally stage mock fights with their tank mates but usually stay out of full fledged battles. 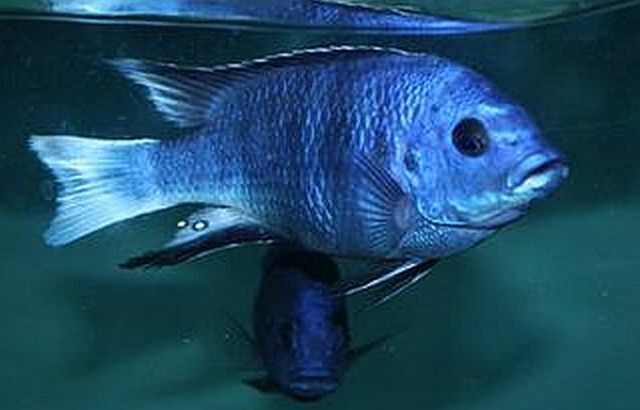 In an aquarium environment they do well with L. caeruleus, Gephyrochromis moorii, and other “mild mannered” Mbuna. Although male and female White Tail Acei are very similar in color and possess the “dummy eggs” on their ventral fins, the easiest way to differentiate between sexes is their behavior. Males are more standoffish while the females tend to be more calm and in their natural environment, the females quietly follow behind the large schools. When ready to spawn and interested male will “shimmy” at the females until one shows interest. Mating is accomplished on a flat rock where the pair swims together shaking, and lightly nipping at each other. The female will eventually deposit her eggs and the male will almost immediately fertilize them. A “normal” spawning can be anywhere from 20 to 80 eggs. In typical mouth brooder fashion, the female will gather up the eggs into her mouth and hold them there for several weeks until hatched. During this time the female will not eat. To get the maximum yield from the spawn, many breeders remove the female or the male from the tank during the holding period until hatching is complete. Males tend to “bump” the females causing them to swallow their young. Although the White Tail Acei is an omnivorous species, they prefer plenty of vegetation in their diets. They are fine with plants such as Java fern, hygrophila polysperma or other hygrophila, vallisneria, and anubias but when you plant them in your tank, it will be occasionally grazed on. The staple for Pseudotropheus acei “ngara” should be a high quality spirulina flake food, Spirulina , cichlid sticks, algae wafers and an occasional treat of live or frozen brine shrimp . White Tail Acei are sold by tropical fish keeping shops as adults or as juveniles when they attain a length of 1 1/2″ to 2″.